All Pakistan Clerk Association 9APCA) has called off his strike after negotiation with Government of Punjab Officials. Minister for Law Mr. Rana Sana ullah Khan talked with APCA leaders. Then PACA also pack-up his Dharna in front of Punjab Assembly hall Mall Road Lahore. An Protest Jalsa held at Cooperative Department on Mall Road Lahore. large number of clerks employees participated in the demonstration. Govt. Employees chanted slogan against the Government. 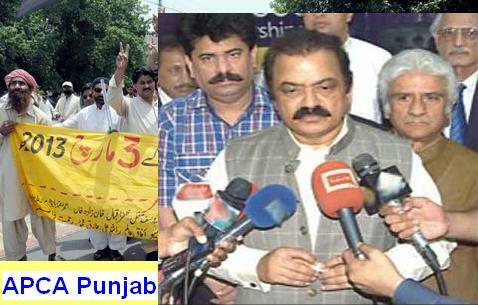 Rana Sanaullah assured that after Budget Session, APCA demanded will met within 10 days. While Chief Minister Shahbaz Sharif will announce APCA Employees Package in a Govt Employees Convention. After the approval of Summary, Notification will be issued accordingly.